Although breakfast can usually be easily made at home, I often find myself in a restaurant munching on scrambled eggs. It could be that I like to eat out... Duh... Hey, there are a multitude of reasons we go out for breakfast. 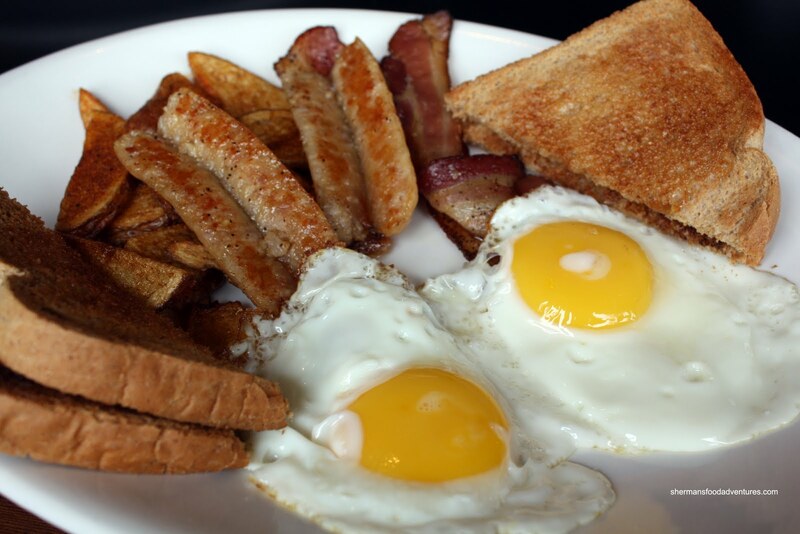 Places like Bon's off Broadway are just plain cheap while brunching at the Pan Pacific can be seen as extravagant. Price, location and venue - whatever the reason may be, doing breakfast or brunch at a restaurant does have its charm. When my son declared he wanted breakfast for dinner the other night, I had promised to take him out for breakfast in the morning (generally when breakfast is eaten). H owever, back in my University days, breakfast was whenever we were hungry, especially when you could have it anytime at Denny's. Seeing how there is a coupon in the Entertainment Book, it seemed like a good idea to give the Tipper a try even though some of their prices seemed a bit high. We decided to get one breakfast each with the kiddies sharing an order. For myself, I went for the Big Breakfast which includes 2 eggs, 2 sausages, 2 strips of bacon, 2 slices of toast, hashbrowns and 1 French toast. I though most of the items were prepared decently. The sunny side eggs were as such, the toast was crunchy, sausages not overcooked (despite the split-fry method, which I'm not a big fan of) and bacon crispy. I didn't like the hashbrowns, they were limp, oily and not crispy at all. 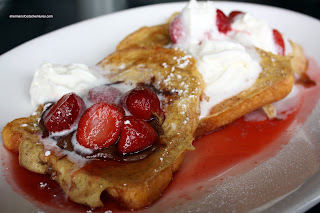 Same with the French toast, it was sad looking being quite pale and possibly in need of a bit more egg. Viv went for the most expensive breakfast on the menu which was Buffalo Joe's Special at $13.99. 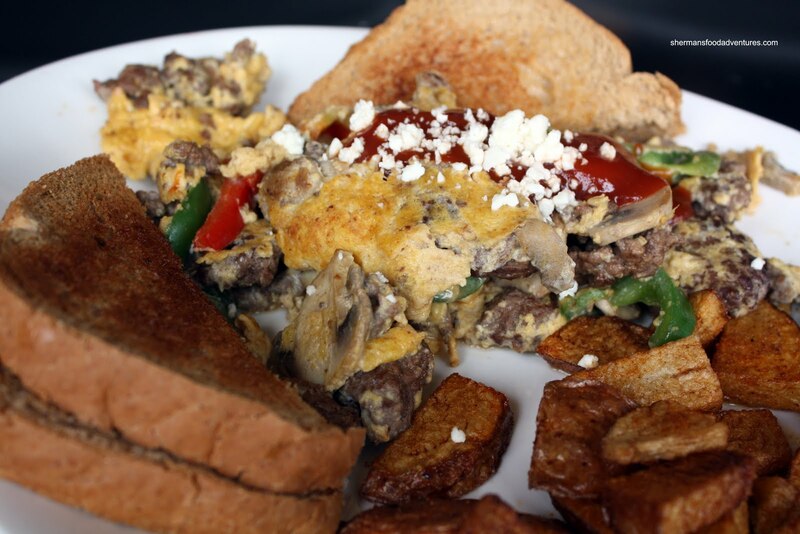 Resembling a scramble or hash, it consisted of a buffalo patty, eggs, peppers and mushrooms topped with chipotle ketchup and feta. Hashbrowns and toast rounded out the dish. The lean meat made for non-oily eats, which was a good thing. 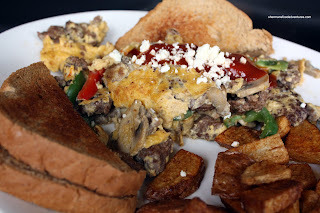 The chipotle ketchup gave a slight kick to the scramble; but personally, I would've liked even more heat (Tobasco anyone?). Although it was not bad, the price tag is dangerously close to fine dining breakfast options. The kiddies shared the Nutella French Toast. The concept for this dish was good; yet the execution was a bit lacking. 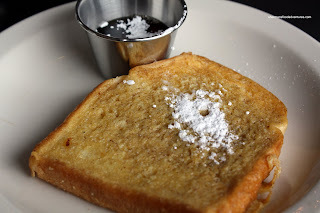 Once again, the French toast was a bit plain. So the toppings should make the dish. However, there was a bit too much Nutella which really overwhelmed the strawberries. To be fair, this was still a decent breakfast; but at $11.89, a little pricey. Once again, I'm torn. The breakfast as a whole was pleasant despite some issues. Moreover, the service was very friendly and welcoming. But I cannot get over the prices. Sure, we picked the 2 most expensive items on the menu; yet we still felt it didn't warrant the pricing considering the venue and location. I'm curious to see if lunch or dinner works out to be a better value because even with the Entertainment coupon, the bill came out to $33.00 without tip. And guess where I was eating last night? That is spendy for breakfast. I went there for lunch and had the best veggie burger but then again i was crazy hungry that day. Great blog. I think CPR would not be enough. 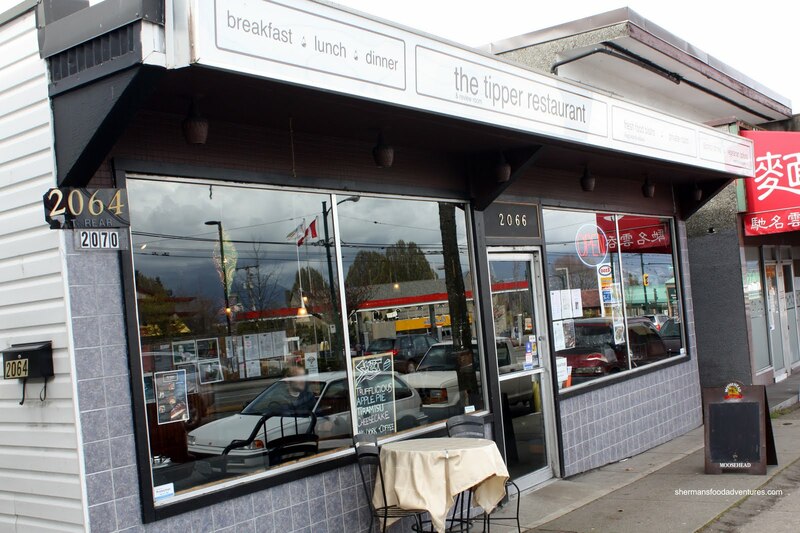 We go to the Tipper often. Its the only decent burger joint in the area, and its cheaper than White Spot, and some nights has live music in the back. There is a great deal one day of the week where you get a free beer with your burger. I recommend the blackened chicken burger, buffalo burger, and the chowder. Thanks, I suspected that their other menus might have some gems at reasonable prices. Too bad breaky is not really a deal. I have to say that I am disappointed in your comment that the meal was potentially not worth the price because of the "location". Location truly should not be a factor. When I go out to eat and when I return to a place, it is because the food is honest food and tastes good. Also, the best places I have eaten often qualify as "dives". Just because a million dollars was spent on the "room" of an eating establishment *cough Cactus Club cough* does not by default make the meal a good one, nor should it. Eating is about food, not decor and what 'hood its in. Welcome Jessica! I totally understand your viewpoint on this. And trust me, I love dives as much as the next person. Well, Kim probably loves them more than me... Anyways, I think you're missing my point. In terms of the food, I wasn't necessarily impressed in the first place. To top it off, the prices are indeed a bit high for this type of restaurant and its location. What I mean by that is that operating such a restaurant on Kingsway at Victoria is inherently less expensive than in Downtown. That is a fact. I'm not even talking about decor, fancy staff or any glitz. Thus, the prices have to reflect as such. For the price I paid, I could easily go Downtown and eat breakfast at a number of places which, in my opinion, are better. So yes, I do believe that location does matter in terms of pricing. Just like how Acme Cafe really shouldn't be charging their prices where they are located. Jessica, unfortunately, there will be times were location is indeed a factor: chains aside, where prices are somewhat standarised, every single detail in the cost of doing business is factored in the price of the dish: Be it wages, ingredients, decoration, rent, etc. etc. I do agree with you, some of my best meals have been in places that "normal" Downtown crowd won't get near to; however, I tend to be the exception rather than the general rule. Having said that, while I haven't been to The Tipper, I do agree that prices are higher than what I would expect paying. To make a sort of analogy, take banh mi. In the Kingsway area (a couple of blocks west of The Tipper), you can get them for ~$3; however, in the downtown area, you will see similar sandwiches for an additional $0.50 if not $1 surcharge. This is something I would expect solely based on location because the rest is pretty much the same. Or, the flip side, at $14, you could have gone to somewhere fancier if it is the same $$$.